(Nanowerk News) No methods currently exist for the early detection of Alzheimer's disease, which affects one out of nine people over the age of 65. Now, an interdisciplinary team of Northwestern University scientists and engineers has developed a noninvasive MRI approach that can detect the disease in a living animal. And it can do so at the earliest stages of the disease, well before typical Alzheimer's symptoms appear. Led by neuroscientist William L. Klein and materials scientist Vinayak P. Dravid, the research team developed an MRI (magnetic resonance imaging) probe that pairs a magnetic nanostructure (MNS) with an antibody that seeks out the amyloid beta brain toxins responsible for onset of the disease. The accumulated toxins, because of the associated magnetic nanostructures, show up as dark areas in MRI scans of the brain. Fluorescent amyloid beta oligomers (green), bound to cultured hippocampal neurons, were detected with greater than 90 percent accuracy by the magnetic nanostructure probe (red). This ability to detect the molecular toxins may one day enable scientists to both spot trouble early and better design drugs or therapies to combat and monitor the disease. And, while not the focus of the study, early evidence suggests the MRI probe improves memory, too, by binding to the toxins to render them "handcuffed" to do further damage. "We have a new brain imaging method that can detect the toxin that leads to Alzheimer's disease," said Klein, who first identified the amyloid beta oligomer in 1998. He is a professor of neurobiology in the Weinberg College of Arts and Sciences. "Using MRI, we can see the toxins attached to neurons in the brain," Klein said. "We expect to use this tool to detect this disease early and to help identify drugs that can effectively eliminate the toxin and improve health." Details of the new Alzheimer's disease diagnostic are published by the journal Nature Nanotechnology ("Towards non-invasive diagnostic imaging of early-stage Alzheimer's disease"). Klein and Dravid are co-corresponding authors. The emotional and economic impacts of Alzheimer's disease are devastating. This year, the direct cost of the disease in the United States is more than $200 billion, according to the Alzheimer's Association's "2014 Alzheimer's Disease Facts and Figures." By the year 2050, that cost is expected to be $1.1 trillion as baby boomers age. And these figures do not account for the lost time of caregivers. This new MRI probe technology is detecting something different from conventional technology: toxic amyloid beta oligomers instead of plaques, which occur at a stage of Alzheimer's when therapeutic intervention would be very late. Amyloid beta oligomers now are widely believed to be the culprit in the onset of Alzheimer's disease and subsequent memory loss. In a diseased brain, the mobile amyloid beta oligomers attack the synapses of neurons, destroying memory and ultimately resulting in neuron death. As time progresses, the amyloid beta builds up and starts to stick together, forming the amyloid plaques that current probes target. Oligomers may appear more than a decade before plaques are detected. "Non-invasive imaging by MRI of amyloid beta oligomers is a giant step forward towards diagnosis of this debilitating disease in its earliest form," said Dravid, the Abraham Harris Professor of Materials Science and Engineering at the McCormick School of Engineering and Applied Science. There is a major need for what the Northwestern research team is doing -- identifying and detecting the correct biomarker for new drug discovery. Despite extraordinary efforts, no effective drugs exist yet for Alzheimer's disease. "This MRI method could be used to determine how well a new drug is working," Dravid said. "If a drug is effective, you would expect the amyloid beta signal to go down." The nontoxic MRI probe was delivered intranasally to mouse models with Alzheimer's disease and control animals without the disease. In animals with Alzheimer's, the toxins' presence can be seen clearly in the hippocampus in MRI scans of the brain. No dark areas, however, were seen in the hippocampus of the control group. 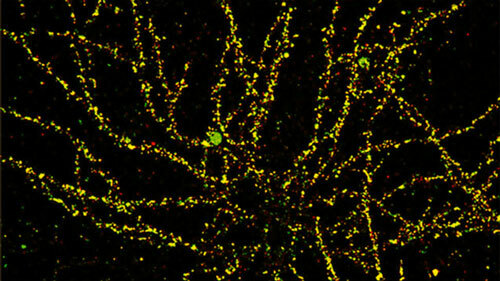 The ability to detect amyloid beta oligomers, Klein said, is important for two reasons: amyloid beta oligomers are the toxins that damage neurons, and the oligomers are the first sign of trouble in the disease process, appearing before any other pathology. Klein, Dravid and their colleagues also observed that the behavior of animals with Alzheimer's improved even after receiving a single dose of the MRI probe. "While preliminary, the data suggests the probe could be used not only as a diagnostic tool but also as a therapeutic," said Kirsten L. Viola, a co-first author of the study and a research manager in Klein's laboratory. Along with the studies in live animals, the research team also studied human brain tissue from Northwestern's Cognitive Neurology and Alzheimer's Disease Center. The samples were from individuals who died from Alzheimer's and those who did not have the disease. After introducing the MRI probe, the researchers saw large dark areas in the Alzheimer brains, indicating the presence of amyloid beta oligomers.